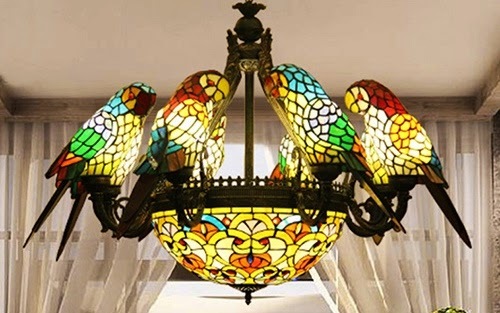 The unique feature of this chandelier other than its stunning creativity is the fact it can be placed in almost any room in your home. It looks especially nice as a staircase chandelier and makes a grand statement overhanging a balcony. The lighting is warm, the colors are vibrant and you can almost hear the parrots converse. The eight, yes, eight, parrots are perched on their own individual stands and ring the stained glass light bowl. The metal is an alloy with an antiqued bronze finish, sturdy and well crafted. Truly an original conversation piece, it even looks wonderful with the lights turned off!